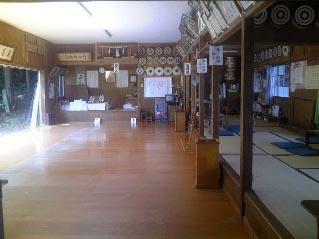 Ryokan with a Kyudo (Japanese Archery) Range. Located at the base of Shiga Kogen (venue for the 1998 Winter Olympics) in Shibu-Yudanaka Onsen. Close to Jigokudani Wild Monkey Park. 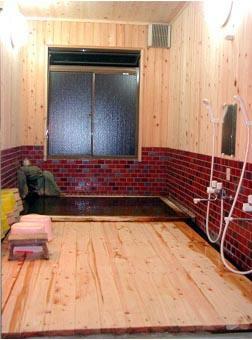 The onsen bath is 100% natural mineral water completely free-flowing and the bath is made out of hinoki (Japanese cypress). It is available for bathing 24 hours a day. In addition, guests are welcome to try Kyudo, Japan's traditional archery, as Uotoshi Ryokan has a Kyudo range attached to the inn. Having a chance to do Kyudo is popular with guests from overseas. Wheelchair accessible only on the 1st floor. 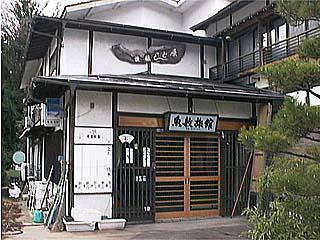 ¥4,530- (lodging), Dinner +¥2,600, breakfast +¥550. From Shinshu-Nakano IC, Take Route 29 / Route 292 10km to the Togari-Yudanaka IC. Turn left from the offramp, cross teh bridge and at the signal turn right. Follow the river southeast to the Yudanaka Station intersection and turn right, recrossing the river. At the "T", turn right and Uotoshi Ryokan will be on the left.